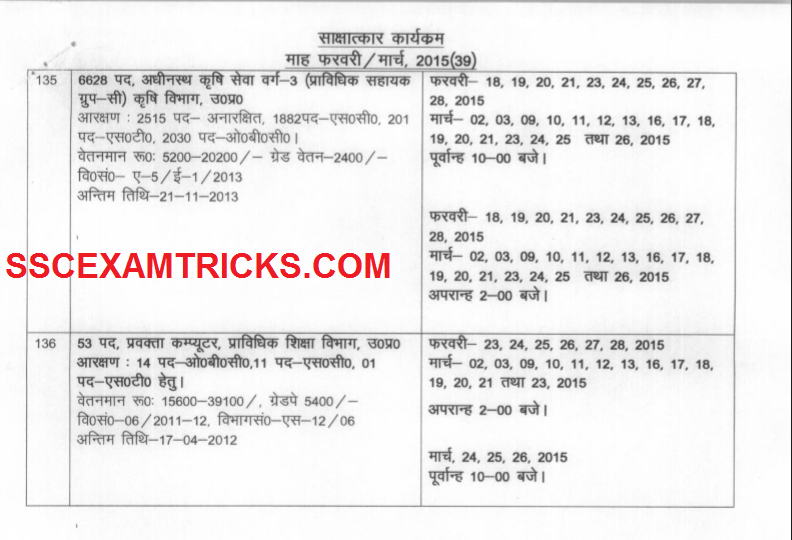 Uttar Pradesh Public Service Commission (UPPSC) has released Interview Schedule to be held on various dates of Month February and March 2015 for the various posts i.e. Computer Lecturer, Physics Lecturer, Mathematics Lecturer, English Lecturer, Fire Brigade Officer and Technical Assistants Group C in various Departments i.e. Technical department, Agriculture Department and Fire Brigade Department. The interview is scheduled on various dates’ from 18th February 2015 to 26th March 2015. The detail of interview schedule along with instructions to attend interview has released on the official website of UPPSC. Thousands of candidates are called to attend interview scheduled in Feb/March 2015. The interview schedule or calender has released 15 days before the starting date of interview so that candidates can plan/ prepare according to their interview date. The interview will be conducted along with document verification to check the originality of candidates. Candidates who are going to attend interview, keep their original documents along with two set of photocopy of original document for interview round. UPPSC has also released name of posts, no. of posts, category wise detail of vacancies, pay scale of the posts, department name, last date to apply for exam, advertisement detail for better understanding of interview schedule of candidates. Those candidates who had applied for these posts can download their interview schedule/ interview date / interview calender from the direct link provided in the end of the posts. · Interview Schedule Dates - from 18th February 2015 to 26th March 2015. · The Interview Calender for Feb/March 2015 will be displayed on the screen. · Note down the dates/ schedule of concern Interview. · Save and print Interview page for the Interview requirements. The interview will be conducted along with document verification stage in which original document of candidates will be checked to match the originality of the candidates. It is mandatory for candidate to bring their original documents along with two set of photocopy of original document at the venue of interview. No candidate will be interviewed without having original documents and photocopy sets of documents with them. Selected candidates are required to bring computer generated online application, result print, original documents (10th, 12th, UC DMC, Cast certificate –If applicable etc.) and one set of self-attested of all the documents to the venue of interview. 10th Certificate is used for Age Proof. Candidate must bring at least one Address proof i.e. PAN Card, Ration Card, Aadhar Card, Voter card or Driving License. Candidates are advised to bring two extra colored recent passport size photograph (same as pasted on computer generated application form) required for application form or other document requirements. Candidate must bring Caste/PWD/EXS certificate to claim for seat available for reserve category. If the candidate is an employer of any organization then it is mandatory to bring original as well as photocopy of NOC (No Objection Certificate) with them.